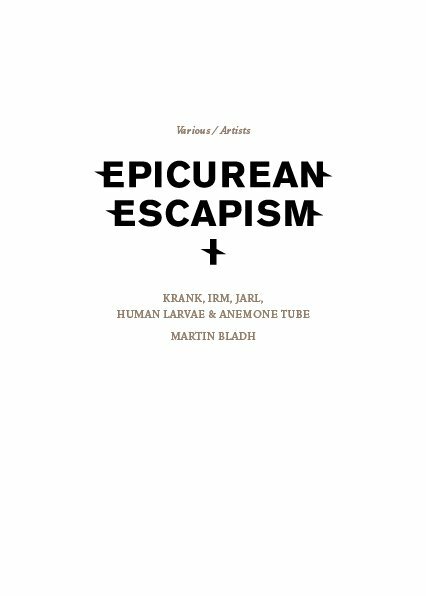 In August 2014 the third instalment of the Epicurean Escapism Festival was held in Berlin, when concurrently this ‘Epicurean Escapism I’ compilation was released to commemorate the first instalment of the festival from 2012. So whilst such a post festival release would not ordinarily cause too much confusion, this is despite the fact that a compilation tape and accompanying DVD was already issued in 2012 in association with the first Epicurean Escapism festival (reviewed here), and intriguingly the majority of content on the original version is not featured on this set. For this updated version it includes new and additional material from the majority of the same acts whom were featured on the original tape compilation. Likewise the packaging here differs from the original in that it mirrors the style and formant of the ‘Epicurean Escapism II’ compilation (released in 2013), where the CD and DVD were housed in a catalogue booklet to provide a visual document of participating artists. Does all this amount to unnecessary confusion? Possibly, yet it is ultimately the quality and interest of this compilations content which is of far greater importance. For the musical parts, Krank leads off the CD (the rebranded Kraang project of the John Murphy), but now featuring the inputs of Annie Stubbs and Till Brüggemann. Here the project delivers a hazy and disorientating industrial soundscape of sporadic horns, loose loops, swirling industrial fragments and ritualised sonic clutter. However the surprise comes with the edition of late night lounge/ jazz vocals courtesy of Annie Stubbs, where these ‘song’ focused vocals are clearly an interesting and divergent addition to counter the generally non-musical focus of the post-industrial soundscape. IRM follow next and whereas a live track was featured on the original tape compilation, here they step up with an exclusive contribution in the form of a lengthy track ‘Triptych’. This 17 minute track effectively which amounts to ‘medley’ composition which remixes material lifted from the conceptual triptych formed by 2008’s ‘Indications of Nigredo’ MLP, 2010’s ‘Order4’ and the recently issued 2014 album ‘Closure’. Moving through three main segments, this track covers the majority of known and lauded elements of IRM and it almost goes without saying that the group are revered around these parts with this track being no exception. Agonised physiological focused vocals, tense droning soundscapes, thrummed atonal bass, and crunching metallic noise mark the path, and whilst recognised elements of original tracks remains, these have been recontextualised into new and engaging forms to compete a strong and focused track. For the third track Human Larvae and Anemone Tube have collaborated on an extended piece, noting that both previously featured separate tracks on the original tape. With both acts having quite distinctive sounds, they have certainly achieved a pleasing amalgam here. Effectively containing two halves, the first part is an excellent slower burner of cyclic layered loops to generate droning power electronics soundscape, with the sharp distortion and delay treated vocals of Human Larvae sitting perfectly within the mix. For the latter half the piece moves toward more serene quasi-orchestral drone to dark ambient territory, where I assume that Human Larvae’s aesthetic has driven the first half, whilst Anemone Tube the later. All in all it is a great pairing of the divergent sound of these two projects. Jarl – being the solo project of Erik Jarl of IRM – should be a relatively well-recognised project by now, whom presents the fourth and final track of the CD compilation. Here Jarl deliver a monolithic 25 minute track ‘A Case Of Inbreeding: A Homage To My Doppelganger’, where Jarl does what he does rather well. Essentially a subtle drone and low pulse mark the introduction, where there track forges a gradually droning evolution as additional looped layers and added at a glacially pace. The atmosphere of the track balances the ominous with the serene and spans its length with ease and general fits the recognised Jarl sound. ‘DES’ forms part of his artistic study of Martin’s fascination with the UK serial killer Dennis Nilsen, where this video is the video counterpart of the book of the same name and obviously exploring the same thematic material. Of particular interest is that some of the more poetic spoken lyrics of this piece were also utilised on IRM’s latest album ‘Closure’, which illustrates Martin’s cross pollination of themes and ideas across multiple artistic platforms. The film cuts between various stages scenes which also reflects the book’s content, and also uses extensive dialogue samples from both interviews with Dennis as well as audio sampled from an audiobook for Brian Master’s biography on Dennis entitled ‘Killing For Company: Case of Dennis Nilsen’. ‘Cycle’ functionally operates as a visually comparative work, which appears to contrast a young and happy child (old home footage of who appears to be a young smiling Martin), counterpointed with visuals potentially relating to the person he has evolved into through the explorations of his obsessions, which is set to interview dialogue and sporadically harsh but generally subdued experimental industrial noise backing. ‘Pig and Tomboy’ (the only film featured on the original compilation version), involves a naked seated figure and a standing aggressor in a pig mask who manipulates his compliant and possibly drugged subject. This main scene (amongst others) progresses seemingly in response to an audio collage of interview dialogue (which has been collated and contributed by Peter Sotos), which deals with a girl’s decent into drug use, prostitution and subsequent death by unknown means. ‘Hole’ is the shortest film work on offer, which with its visual cutup of close up shots of teeth, lips and the inside of the mouth set to an anxiety inducing and skittish soundscape, is mostly abstract in its delivery and potential interpretation. The title of the final film ‘Matt 5:29 – 30’ obviously refers to the biblical passage which states: “If your right eye causes you to stumble, gouge it out and throw it away. It is better for you to lose one part of your body than for your whole body to be thrown into hell. And if your right hand causes you to stumble, cut it off and throw it away. It is better for you to lose one part of your body than for your whole body to go into hell”. However here this passage has been reinterpreted in context of Martin’s own obsessive preoccupations. Thus within the film it shows two small mirrors placed at right angles in front of a short stool, where the naked figure of Martin (back to the camera) performs what is clearly meant to represent self-castration. Noting this has been a constant theme of Martin’s work and particularly as this was a central theme of the IRM album ‘Order4’, the film’s low droning soundscape and thematic preoccupations could be considered as a visual addendum to ‘Order4’. Given that the content and concepts explored are obviously deeply personal to Martin, his film works are a bold display of his personal obsessions and perhaps internalised perceptions of himself. Whilst some may view the visual material as ‘shocking’, this is far from amounting to any sort of clumsy attempt at shock value. Although these video works may not clearly be of interest to all, but for anyone intrigued by Martin’s lyrical and conceptual preoccupations, these films provide further visual exploration. Moving onto the visual presentation of the compilation set, within the oversized cardboard booklet ‘catalogue’ cover, Martin Bladh provides further art and writing under the title of ‘Victim and Executioner’. Across 24 pages it provides artwork and a range of writings providing additional information on Martin’s inspirations and obsessions. This includes quotes from third parties, personal impressions and background information framing the context of his own film works, in addition to a conceptual written piece ‘Off-Stage Slideshow’, as well as structural details for a theatre piece ‘Death of Narcissus II’. This additional visual and written material certainly makes for complimentary and interesting reading and functions to both confirm and refute some of the above impressions of Martin’s film works (particularly given the above review of the short films were written prior to reading this information). Over the 3 years that the Epicurean Escapism festival has been operating it has quickly elevated itself to being at the forefront of multi-angled festival which seeks to bring together music, film, visual art. For those not able to attend in person, these releases are excellent documents of each of the events, to ensure there is a legacy beyond the merely the memory of those in attendance. This is also another fine example of how a well a compilation as a format can work when a focused and nonstandard approach is employed. Recommended. This entry was posted in 2014, dark ambient, death industrial, drone, experimental, industrial, power electronics, Silken Tofu, The Epicuriean by noisereceptor. Bookmark the permalink.